I made a few scrabble tile charms for a swap. I did two for Twilight - Alice and Bella. The next one is the Heart group - I used a photo of one of my quilts that had hearts on it. The next one is the Skull group. I did Donald Duck for the Disney group. The Horse photo is my horse done for the Animal group. And the last one is a lily from my garden for the Flower group. I followed directions for these one a web site. 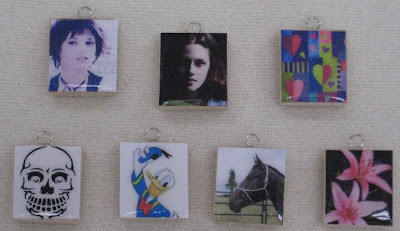 Here is the link http://www.makeandtakes.com/links/scrabble-tile-pendant-tutorial I printed photos and then sealed them with Mod Podge, Cut them to fit the tiles and glued in place. When dry I could add the Diamond Glaze. When dry, glue a hanging bail on the back side. Very nice! I have a Scrabble tile pendant, and I have always wondered how to make those. Glad to know it's not that hard.